Pakistan says it has asked Facebook to help investigate "blasphemous content" posted on the social network by Pakistanis. Earlier this week Pakistani Prime Minister Nawaz Sharif voiced his support for a wide-ranging crackdown on blasphemous content on social media. 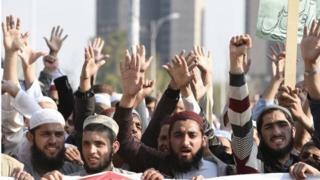 Then on Thursday, Interior Minister Chaudhry Nisar reasserted Pakistan's determination to tackle the issue, saying he would take "any steps necessary" to make sure Pakistan's message got across. He said he had asked officials to liaise with the FBI in the US and with social media platforms on a daily basis. "Facebook and other service providers should share all information about the people behind this blasphemous content with us," he is quoted as saying by the Dawn newspaper. There has been little official description of what blasphemous content has been found online so far, but in the past blasphemy accusations have ranged from depictions of the Prophet Muhammad to critiques and inappropriate references to the Koran. But some critics say that this latest move is simply a way of cracking down on dissent. When five liberal bloggers and activists recently went missing, they were accused of blasphemy on social media. It is a very serious allegation in the deeply conservative nation, which can make those accused of it a target of public anger. In Pakistan there is a growing popular resentment to this so-called "blasphemous content" on social media, especially on Facebook. People are often openly accused of "committing blasphemy on social media". One top security agency has openly urged the masses to report anyone who is involved in posting such material online. Digital rights groups have expressed "serious reservations" and have called such steps "playing with the lives of innocent people". They have also criticised Facebook "for colluding with authorities and censoring content infringing freedom of expression". In a statement quoted by the AP news agency, Facebook said it viewed government requests with care keeping in mind "the goal of protecting the privacy and rights of our users. Pakistan has often blocked access to pornographic sites and sites with anti-Islamic content and in 2010 a Pakistani court blocked Facebook over caricatures of the Prophet Muhammad.